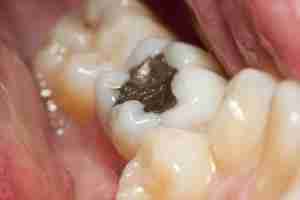 Amalgam fillings, also known as metal or silver fillings, are a blend of copper, silver, tin and mercury. This material has has been used in dentistry for decades.The controversy over amalgam fillings centres on how much mercury the fillings release and how much the body absorbs. The current position held by the ADA (American Dental Association) and BDA (British Dental Association) is that it is a safe restorative material. The FDA (USA) does not recommend that you have your amalgam fillings removed or replaced if your fillings are in good condition and there is no decay. The main concern today is the environmental impact of dental amalgam due to water contamination from removing amalgam fillings. The European Commission in 2012 study reports that there is currently no scientific consensus on the direct health effects of dental amalgam (except allergies) and the focus is on environmental impact, hence the aim to manage dental amalgam waste adequately. The WHO has a phase-down approach on the use of mercury in dentistry where nations may pace this according to domestic needs. This is in accordance by the treaty agreed by United Nations Environmental Programme in 2013.